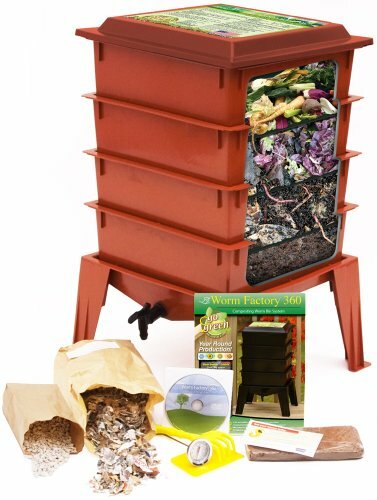 This amazing worm farm transforms the organic waste from your kitchen into organic fertilizer for your garden. It's easy to use! Just fill a working tray with well-prepared bedding, compost worms and food scraps. As the worms finish composting, they will migrate upward into the tray above, leaving rich castings behind. This bin features a compact and small size so it will not take up much room in your home and provides the perfect capacity for household waste management. Worms start at the bottom and migrate upwards as they go, leaving behind tray after tray of rich compost. A reservoir at the bottom captures "worm tea" — an ideal, odor-free liquid fertilizer. The kit includes all the accessories you need to get started. 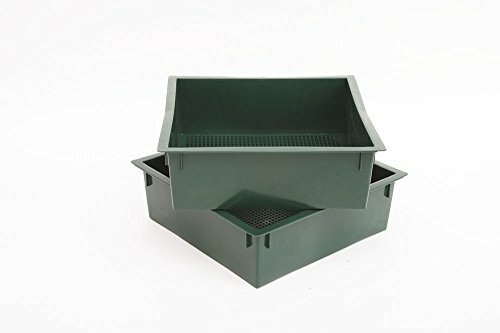 The bin comes with 4 pieces of working trays, a rack, and 1 pc of Spigot; worms not included! 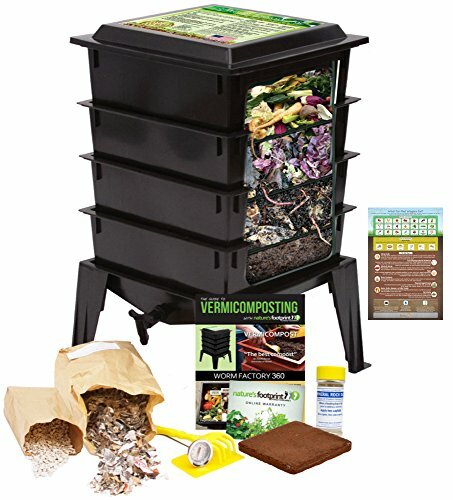 The VermiHut Plus worm compost bin converts the kitchen food waste from your kitchen into organic fertilizer for your garden. 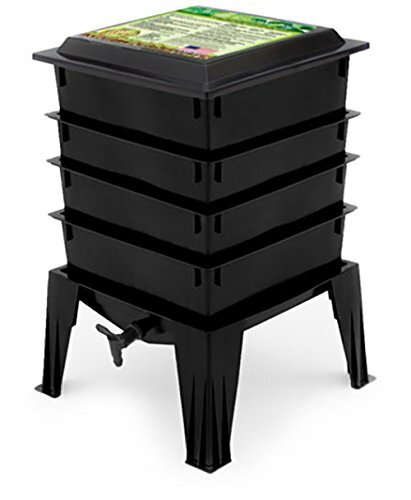 The VermiHut Plus is the next generation of the internationally well-known VermiHut worm bin. It's easy to use! Just fill a working tray with worm bedding, red worms and food scraps. As the worms finish consuming the food scraps, they will migrate upward into the tray above, leaving rich castings behind. In ideal condition, 2lbs or 1kg worms can consume 1lb or 0.5 kg of food scraps per day on average. 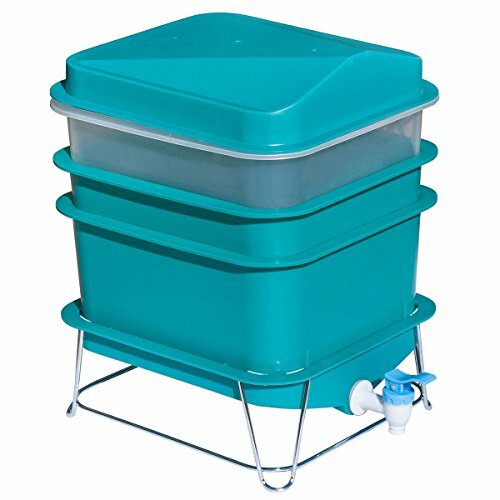 A 5-tray worm bin can house 10 lbs or 5 kgs of worms. 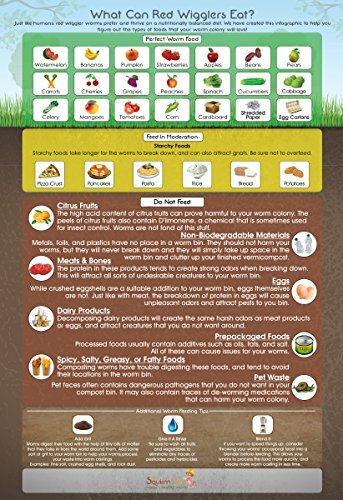 Therefore, it can help to reduce 5lbs or 2.5 kgs food scraps per day. The VermiHut Plus provides the perfect capacity for household food waste management. 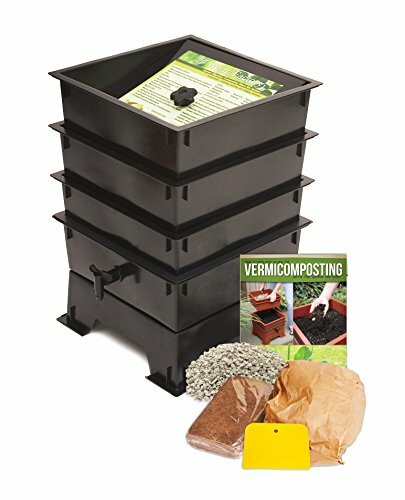 Stackable worm compost bins. It automatically seperates the worms and the castings. High efficiency and easy to use. 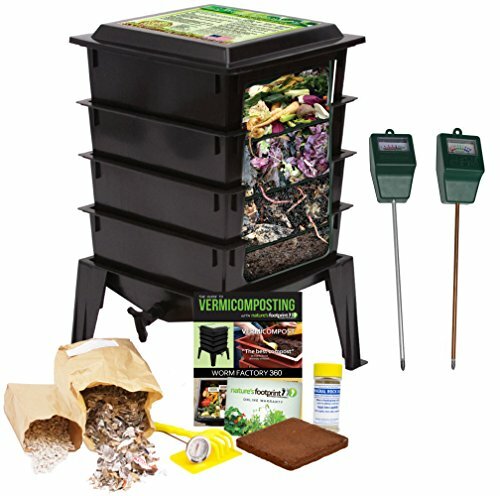 Complete set of tools is provided for easy, clean, and controlable worm composting. 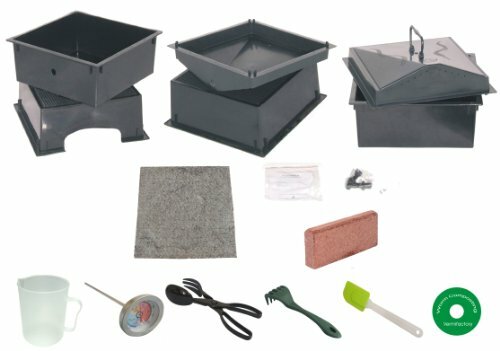 The Worm Compost Accessory Kit gives you all the tools you need to become a master worm farmer! It is important to regularly check the conditions in your worm bin in order to make sure your worms aren't in any danger. Moisture, pH, or temperature issues can mean bad news for your little composting buddies! The kit provides tools for measuring the levels of all three critical factors. 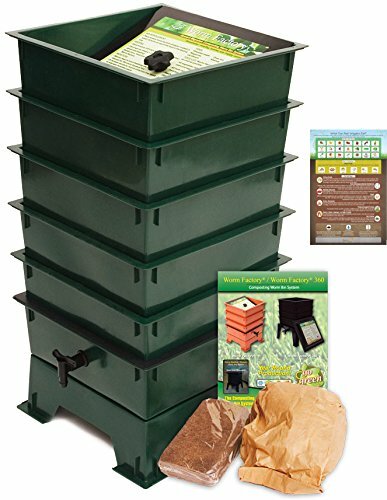 It also contains tools for feeding your worms, turning your bedding, and harvesting your finished worm castings. 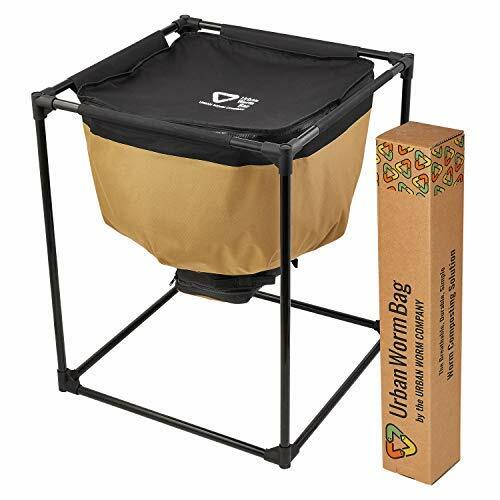 Each of the bedding materials that come in the Worm Factory Refill Kit are in the same convenient size packages that originally came with the Worm Factory 360 composter. 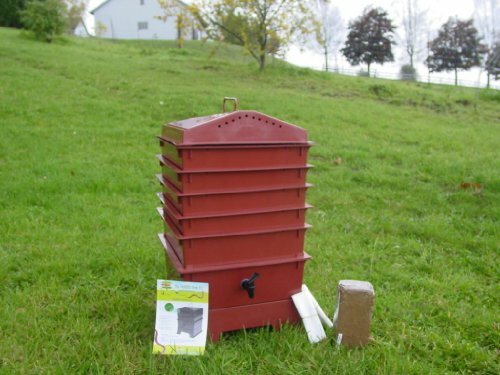 They can also be used with the Worm Factory Standard composter. 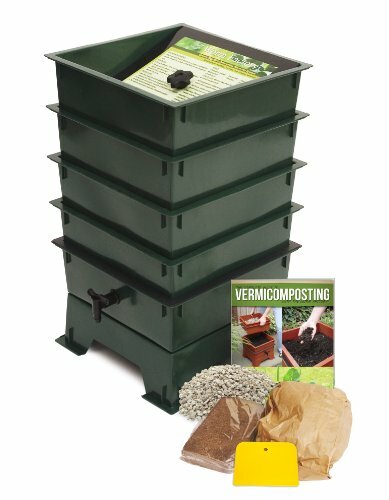 When used as instructed this kit contains enough materials for at least 8 composting trays. Bedding materials play an important role in reproduction rates and impact the manageability of the Worm Factory. They are essential for air space and moisture control. 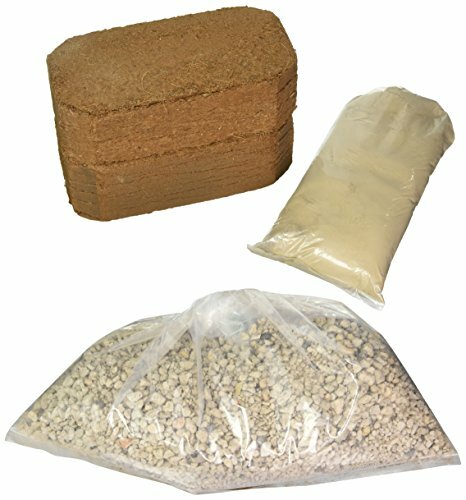 Bedding materials should compose at least 50% of the material you add to the feeding trays. The pumice and coconut coir prevent odors from forming in the Worm Factory360 and the Worm Factory Standard by providing carbon, without which the system would sour. They also keep the materials in the tray from packing tightly. This promotes increased air flow and free movement of the worms. Minerals provide grit for the worms and food for the microbes that are working sight unseen in the Worm Factory, helping to breakdown the food for the worms and ultimately providing nutrient rich vermicompost for optimal plant growth. Nothing can kill worms faster than extreme temperatures! 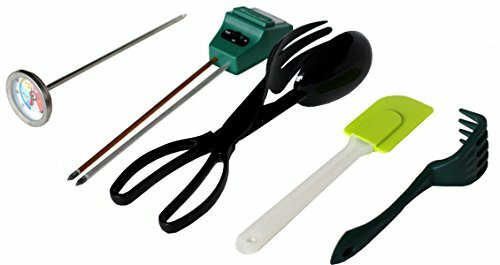 Keep your worms out of danger with the Worm Farming Thermometer. 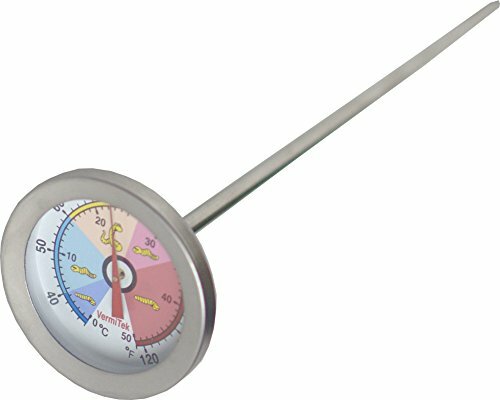 The thermometer has a 8" probe that you stick into your worm bin to measure the temperature of the food / bedding mixture. It can accurately read temperatures between 32 and 125 degrees Farenheit and is color-coded so you can immediately see with a glance if the temperatures are putting your worms at risk. You will be one step closer to becoming a worm composting master when you no longer have to guess the temperature in your bin! DS5BTray Color: Black Features: -Comes with ''Quick-Tips'' lid for easy reference. -Made in USA. -Built in collection tray and spigot for easy draining. 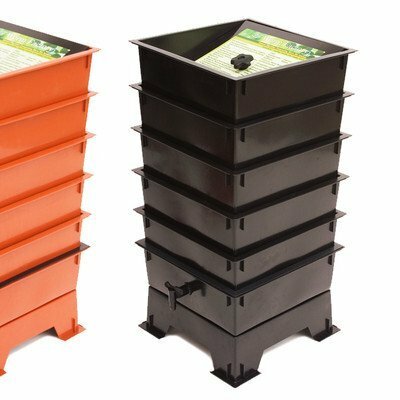 Product Type: -Worm Bins. Material: -Plastic. Country of Manufacture: -United States. Dimensions: Overall Height - Top to Bottom: -16". Overall Width - Side to Side: -16". Overall Depth - Front to Back: -16". Overall Product Weight: -14 lbs. Nothing can put your worms at more risk than extreme conditions in your worm bin! 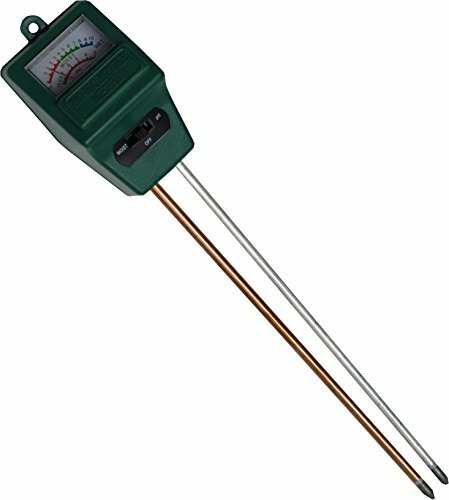 Keep your worms out of danger with the Worm Farming pH + Moisture Meter. Our pH + moisture meter has a 9" probe that you stick into your worm bin to measure the pH and moisture content of the food / bedding mixture. 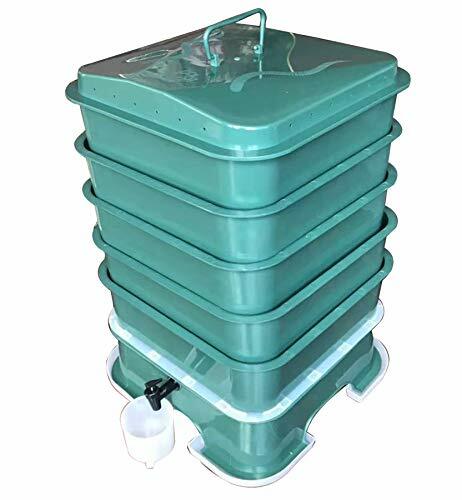 You will be one step closer to becoming a worm composting master when you no longer have to guess about the conditions inside your worms' habitat. Keep your worms out of harms way and pick one up today! Compare prices on Worm Factory Worm Bin at Elevelist.com – use promo codes and coupons for best offers and deals. We work hard to get you amazing deals and collect all avail hot offers online and represent it in one place for the customers. Now our visitors can leverage benefits of big brands and heavy discounts available for that day and for famous brands.